Flag Football, and Athletes, and Bears… OH YES! 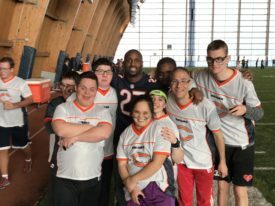 The students and athletes at Hersey High in Arlington Heights have become pros at the concept of inclusion, so it only seemed natural to take their example to the next level and get some other pros involved, too…including players of The Chicago Bears at the Walter Payton Center at Halas Hall. In the summer of 2014, a flag football team for students with intellectual disabilities was started at Hersey High School by former coach, Craig Ameel along with the support of math teacher & coach of the varsity football team, Joe Pardun. Approximately 20 athletes were involved in the beginning, and came from the Township High School District 214 Career Life Skills program for children with disabilities. Those athletes were paired with members of the school’s varsity football team, and Pardun said the both sides found tremendous joy in the team. “Just watching them bond- they’re all in school together and now know each other’s names,” Pardun said. Fellow math teacher, John Dyer, jumped on board to help, which was only natural since he had already been running Special Olympics Illlinois activities for students. Dyer noted that basketball and track had been popular team sports for his athletes, so football was a natural addition. Dyer also noted that the flag football team had “a couple of die-hards who are like yes, they love the (Chicago) Bears.” Dyer now runs this program today. 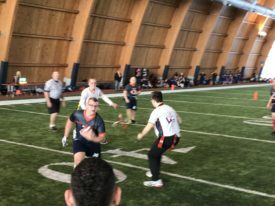 Flag football has been around with Special Olympics, as a national organization, for over a decade while Special Olympics Illinois hosted its first tournament in 2014. In 2015, Hersey High School hosted its first tournament. 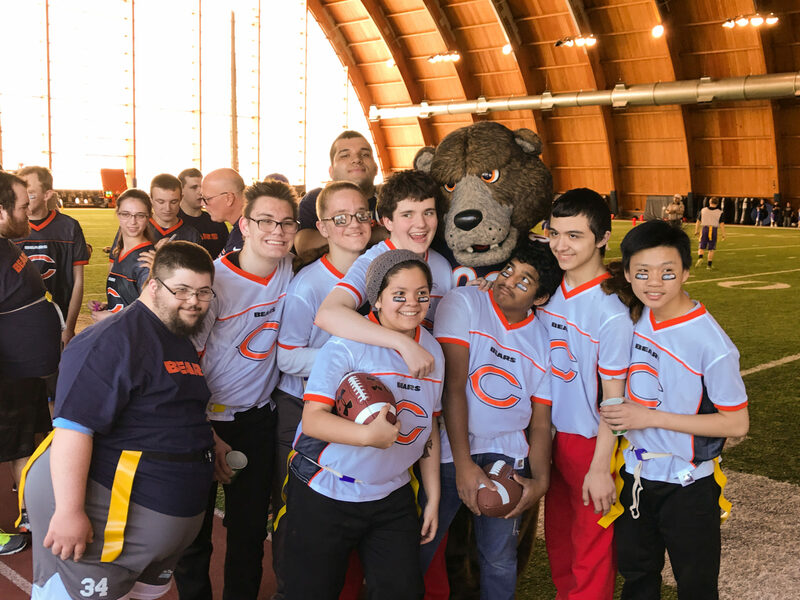 In 2016, the Chicago Bears organization provided memorabilia items to Hersey High School’s tourney, but that obviously was not enough to satisfy the craving to become involved even more, so in 2017 the Special Olympics Illinois Flag Football tournament moved from the high school to Walter Payton Center at Halas Hall and was held on April 8. The Hersey Varsity football player/coaches, Coach Dyer, and the flag football team of Hersey High were part of the approximately 140 athletes and 50 coaches representing 15 teams that played in the tournament that day. Joining them were current Chicago Bears players Sherrick McManis and Charles Leno, Jr., as well as former players Tom Thayer, Rashied Davis, and Garrett Wolfe. Back at Hersey High, students with intellectual disabilities and without have become closer. Their jovial interaction has become a regular site in the halls, in the lunchroom, and on the playing field. 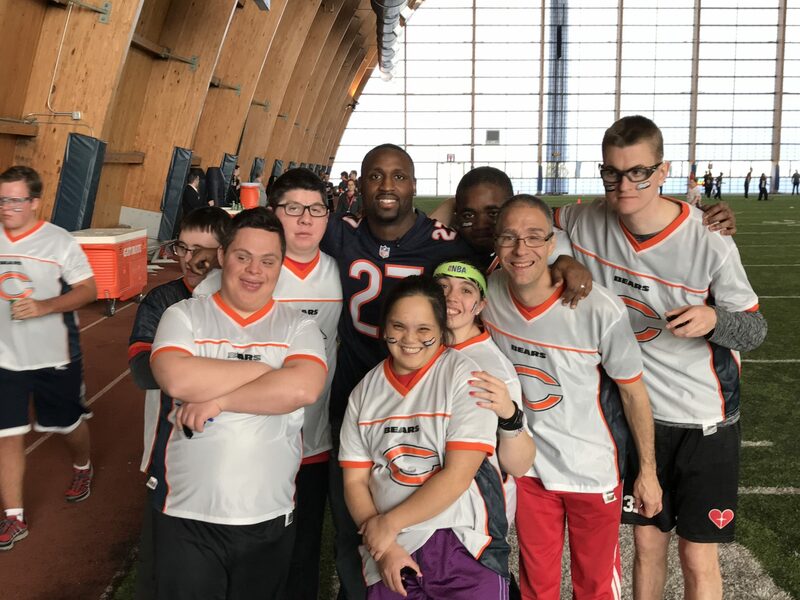 Their example is one to be followed because, in this case, it helped land these talented athletes, dedicated coaches, and nearly 200 others on the field at Halas Hall. What’s next? Indeed, the possibilities are #SOLimitless.